they operate over a wide temperature range; and they have no moving parts. 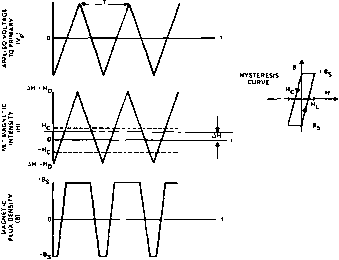 However, magnetometers are not accurate inertia] attitude sensors because the magnetic field is not completely known and the models used to predict the magnetic field direction and magnitude at the spacecraft's position are subject to relatively substantial errors, as discussed in Section S.l. 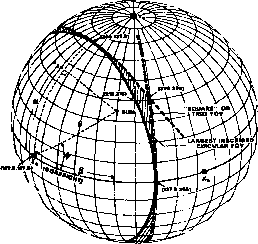 Furthermore, because the Earth's magnetic field strength decreases with distance from the Earth as 1/r3, residual spacecraft magnetic biases eventually dominate the total magnetic field measurement, generally limiting the use of magnetometers to spacecraft below 1000 km; however, attitude magnetometers were flown successfully on RAE-1 at an altitude of 5875 km. Search-coil magnetometers based on the above principle are used mainly on spin-stabilized spacecraft to provide precise phase information. Because the search coil is sensitive only to variations in the component of the field along the solenoid axis, any spacecraft precession or nutation will greatly complicate the interpretation of data [Sonett, 1963]. 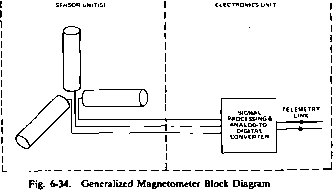 The second type of magnetic induction device is the fluxgate magnetometer, illustrated in Fig. 6-35. 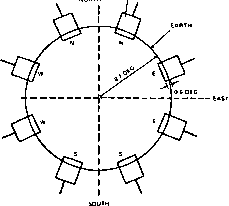 The primary coil with leads and P2 is used to alternately drive the two saturable cores SC, and SC2 to states of opposite saturation. The presence of any ambient magnetic field may then be observed as the second harmonic of the current induced in the secondary coil with leads S, and S2. The purpose of the two saturable cores wound in opposite directions is to cause the secondary coil to be insensitive to the primary frequency. Other geometries used to achieve primary and secondary decoupling utilize helical and toroidal cores. Fig. 6-3S. Dual-Core Fluxgate Magnetometers With Primary and Secondary Induction Coils.